Original UK/current album cover. The original US cover uses a slightly different shot. This Year's Model was Elvis Costello's first album with The Attractions. Most of the songs had been performed live with them prior to the recording of the album. The recording at Eden Studios began at the end of 1977 and was completed in early 1978. The sessions took about eleven days. Early issues of the album have an apparently misprinted sleeve, which cuts off the left side of the front cover (including the letters 'E' from 'Elvis' and 'T' from 'This') and shows a printers' colour bar along the right side (see cover right). This was a deliberate mistake (a favourite technique of cover designer Barney Bubbles), as was pressing "Special pressing No. 003. Ring 434 32 32. Ask for Moira for your prize" between the holding spirals on Side 1. Indeed, people calling the aforementioned number ("Moira" being a press agent at Radar Records) would be rewarded with a badge. Early issues of the LP came with a free 7" single, housed in a Radar house sleeve, with "Stranger in the House" (an outtake from Costellos debut album, as it was thought to be commercial suicide to release a country song in 1977) on side A and a live cover of The Damned's "Neat Neat Neat" on side B. The promotion also included a black and white sticker stuck on the LP's shrinkwrap that said 'Free Album With This Single'. "The concept of him behind a camera for the sleeve of This Year's Model had already been chosen, so I decided to equip Elvis with exactly the same tripod and camera as I was using to create a 'mirror' for him. Alongside a powerful stereo I kept a large record collection at my Camden Studio, and artists would choose music they enjoyed or were interested in for their sessions. Just as we were about to start shooting, Elvis asked me if I had "Hotel California" by The Eagles, and could I play it? I was puzzled by his choice – until he told me that he loathed the record, but wanted to look really pissed off and angry in the shots! We played the record several times during the session and whilst I directed him, I was also aware of his copying some of my own actions as I took the photographs". All songs written by Elvis Costello. The US release on Columbia, two months after the original UK release, dropped "(I Don't Want to Go to) Chelsea" and "Night Rally" and added "Radio Radio" to close side two. Some European versions of the album added "Watching The Detectives" at the end of side one. This non-album single released in 1977 shortly after My Aim Is True was already included on the US version of Costello's first album. The original Japanese release (Radar P-10538F) has "Watching The Detectives" at the end of side two but omits "Night Rally". Note: the Rykodisc reissue placed "Radio Radio" after a 10-second silence following "Night Rally." Note: while the Rykodisc version contains the original album and bonus tracks on one CD, the Rhino version has two CDs. Disc one contains the original UK album plus "Radio, Radio" and disc two contains bonus tracks. Mick Jones – lead guitar on "Big Tears"
^ Jackson, Josh; Martin, Garrett (8 September 2016). "The 50 Best New Wave Albums". Paste. Retrieved 27 December 2017. ^ John M. Borack (2007). Shake Some Action: The Ultimate Power Pop Guide. Not Lame Recording Company. p. 190. ISBN 978-0-9797714-0-8. ^ Joe Bonomo; Greil Marcus; Peggy Whitman Prenshaw (1 October 2012). Conversations with Greil Marcus. Literary Conversations Series. University Press of Mississippi. p. 85. ISBN 978-1-61703-622-4. ^ Erlewine, Stephen Thomas. "This Year's Model – Elvis Costello / Elvis Costello & the Attractions". AllMusic. Retrieved 20 September 2015. ^ Wolk, Douglas (March 2005). "Elvis Costello: This Year's Model". Blender. Archived from the original on 4 February 2005. Retrieved 27 January 2016. ^ Christgau, Robert (1981). "Elvis Costello: This Year's Model". Christgau's Record Guide: Rock Albums of the '70s. Ticknor and Fields. ISBN 0-89919-026-X. Retrieved 16 October 2004. ^ LeMay, Matt (9 May 2002). "Elvis Costello & The Attractions: This Year's Model". Pitchfork. Retrieved 13 May 2006. ^ Eccleston, Danny (March 2002). "Elvis Costello & The Attractions: This Year's Model / Blood & Chocolate / Brutal Youth". Q (188). ^ Sheffield, Rob (6 March 2008). "Elvis Costello: This Year's Model (Deluxe Edition 2008)". Rolling Stone. Archived from the original on 8 August 2009. Retrieved 20 September 2015. ^ Moody, Paul (8 August 2007). "Elvis Costello – This Year's Model". Uncut. Retrieved 20 September 2015. ^ "The 1978 Pazz & Jop Critics Poll". The Village Voice. 22 January 1979. Retrieved 28 October 2007. ^ Levy, Joe; Steven Van Zandt (2006) . "98 | This Year's Model – Elvis Costello". Rolling Stone's 500 Greatest Albums of All Time (3rd ed.). London: Turnaround. ISBN 1-932958-61-4. OCLC 70672814. Archived from the original on 16 March 2006. Retrieved 12 April 2006. ^ "This Year's Girl - The Elvis Costello Wiki". ^ "(I Don't Want To Go To) Chelsea - The Elvis Costello Wiki". ^ Gabrin, Chris. "Chris Gabrin: Elvis Costello, This Year's Model session". Snap Galleries. Retrieved 17 March 2019. 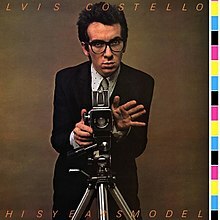 ^ "Elvis Costello - This Year's Model". ^ "dutchcharts.nl Elvis Costello – This Year's Model" (ASP). dutchcharts.nl (in Dutch). MegaCharts. Retrieved 23 October 2011. ^ "charts.org.nz – Elvis Costello – This Year's Model" (ASP). Recording Industry Association of New Zealand. Retrieved 23 October 2011. ^ "norwegiancharts.com Elvis Costello – This Year's Model" (ASP). VG-lista. Retrieved 18 September 2011. ^ "swedishcharts.com Elvis Costello – This Year's Model" (ASP) (in Swedish). Sverigetopplistan. Retrieved 18 September 2011. ^ "Elvis Costello – This Year's Model". UK Albums Chart. Retrieved 23 October 2011. ^ "Complete UK Year-End Album Charts". Archived from the original on 11 January 2012. Retrieved 3 October 2011. ^ "Canadian album certifications – Elvis Costello – This Year's Model". Music Canada. ^ "British album certifications – Elvis Costello – This Year's Model". British Phonographic Industry. Select albums in the Format field. Select Gold in the Certification field. Type This Year's Model in the "Search BPI Awards" field and then press Enter. ^ "American album certifications – Elvis Costello – This Year's Model". Recording Industry Association of America. If necessary, click Advanced, then click Format, then select Album, then click SEARCH.